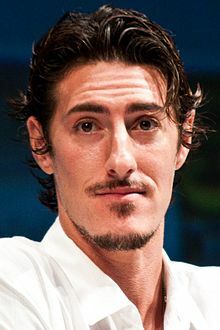 اریک بالفور (اینگیلیسجه: Eric Balfour) آمریکالی موغنی و اوْیونچو. ۲۴ آوریل ۱۹۷۷ ‏ ایلینده کالیفورنیا ایالتینده دۆنیایا گؤز آچیب. 2010 Do Not Disturb Frank Segment: "Rocketman"
1993 Danger Theatre Teenager #2 Episode: "An Old Friend for Dinner"
1993 Step by Step Michael Fielder Episode: "Never on Sunday"
1993–94 Dr. Quinn, Medicine Woman Benjamin Avery Episodes: "The Incident", "Just One Lullaby"
1995 Boy Meets World Tommy Episode: "Pop Quiz"
1995 Kirk Zack Episode: "The Crush"
1996 Champs Danny Episode: "For Art's Sake"
1996 Townies Adam Episode: "The Good Job"
1997 Ink Danny Episode: "Devil in a Blue Dress"
1997 Buffy the Vampire Slayer Jesse Episodes: "Welcome to the Hellmouth", "The Harvest"
1997 Clueless Pizza Boy Episode: "Salsa, Chlorine & Tears"
1998 Dawson's Creek Warren Goering Episode: "Road Trip"
1999 Nash Bridges Cliff Morehouse Episode: "Shoot the Moon"
1999 West Wing, TheThe West Wing Frat Boy #3 Episode: "Mr. Willis of Ohio"
2000 Chicago Hope Jason Kerns Episode: "Hanlon's Choice"
2001 FreakyLinks Chapin Demetrius Episode: "Subject: Live Fast, Die Young"
2001 Chronicle, TheThe Chronicle Mark Griffin Episode: "Only the Young Die Good"
2001 NYPD Blue Charles 'Spyder' Price / Eli Beardsley Episodes: "Peeping Tommy", "Two Clarks in a Bar"
2004 O.C., TheThe O.C. Eddie Episodes: "The Telenovela", "The Goodbye Girl", "The Nana"
2009 Fear Itself Maxwell Episode: "Echoes"
2009 Life on Mars Eddie Carling Episode: "The Dark Side of the Mook"
2009 Law & Order: Criminal Intent Max Goodwin Episode: "Salome in Manhattan"
2009 Monk Lenny Barlowe Episode: "Mr. Monk Is Someone Else"
2010 Saving Grace Jesus Episode: "Loose Men in Tight Jeans"
2011 No Ordinary Family Lucas Winnick Episodes: "No Ordinary Love", "No Ordinary Animal"
2012 Christine Daniel Episodes: "Daniel", "Matthew", "Max", "Boy Magnet"
2016 Ray Donovan Nick Episode: "Norman Saves the World"
2018 Chicago P.D. Spiro Dalon Episode: "Fathers and Sons"
اینگیلیسجه ویکی‌پدیاسی‌نین ایشلدنلری طرفیندن یارانمیش«Eric Balfour»، مقاله‌سیندن گؤتورولوبدور. ( ۲۲ ژانویه ۲۰۱۸ تاریخینده یوْخلانیلیبدیر). قارداش پروژه‌لرده اریک بالفور گؤره داها آرتیق بیلگی‌لر تاپابیلرسینیز. بۇ صفحه‌‌ سوْن دفعه ‏۱۳ مارس ۲۰۱۹، ‏۱۱:۳۴ تاریخینده دَییشدیریلمیشدیر.